As I said yesterday, there were flowers everywhere. Topiaries too. 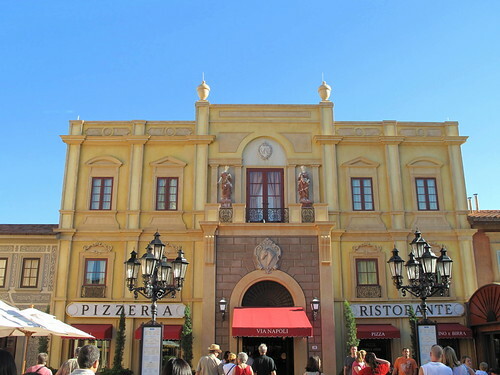 This is Lady and the Tramp at the Italy pavilion. We eventually found cheaper places to eat, but it wasn’t easy. 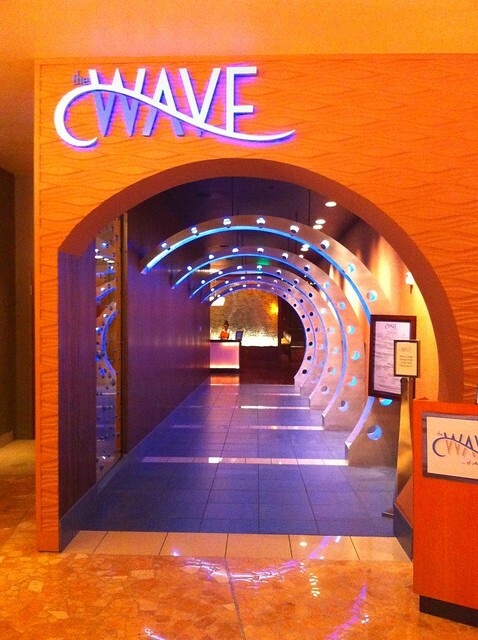 One of the restaurants in our resort. Nice entrance, huh? One of my grandmothers was Norwegian, so I was especially happy to see the stavekirk at the Norway pavilion. 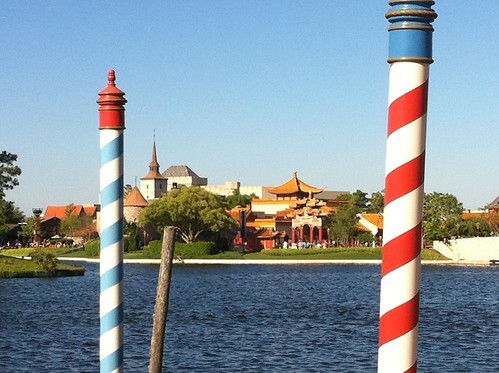 Another glimpse of China from the Italy pavilion. 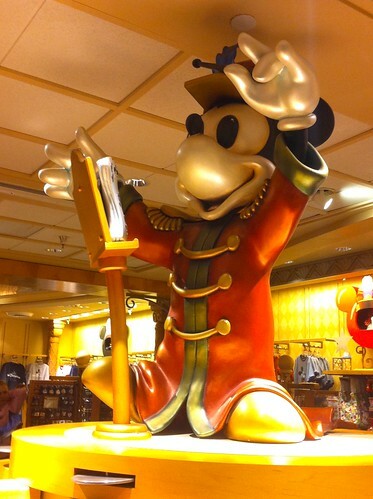 Mickey in one of the gift shops. 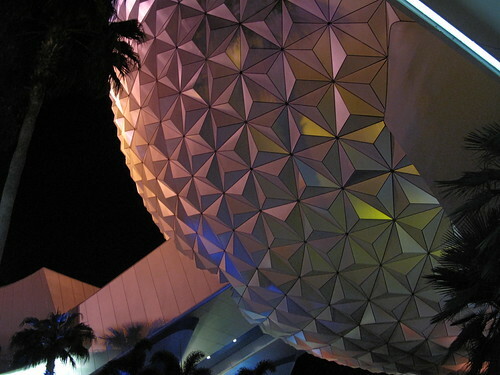 Finally, there’s a huge geosphere in Future World that has a pretty cool ride inside. It takes you through all the stages of modern civilization with very realistic animatronics. That’s Buzz Lightyear with…Elmo? Sorry, my sons are too old for Sesame Street so I don’t keep up anymore. 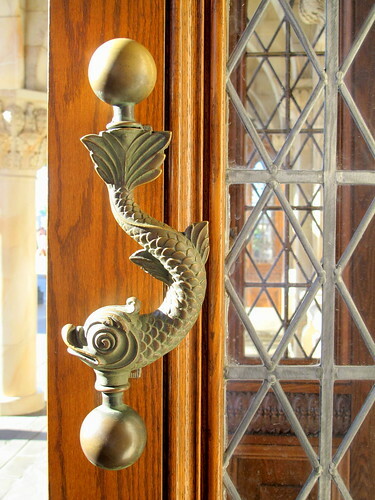 This entry was posted in photography, Travel and tagged Epcot Center, fish door handle, Florida, Future World, geosphere, Mickey Mouse, Mickey Mouse waffle, Norwegian stavekirk, The Wave restaurant, topiary. Bookmark the permalink. I haven’t been to Epcot in many years. What a fun trip down memory lane. 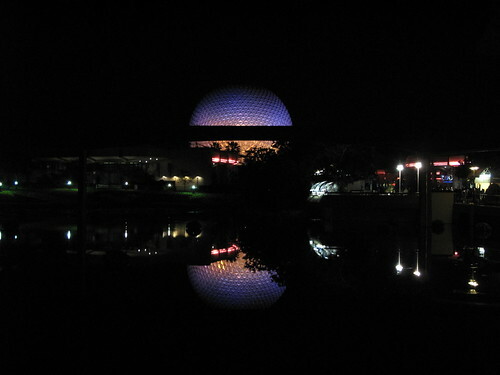 The Epcot sphere in the last shot looks like a moonrise. It’s amazing how much the replicas in the country pavilions look like the real thing. Their attention to detail is impressive. 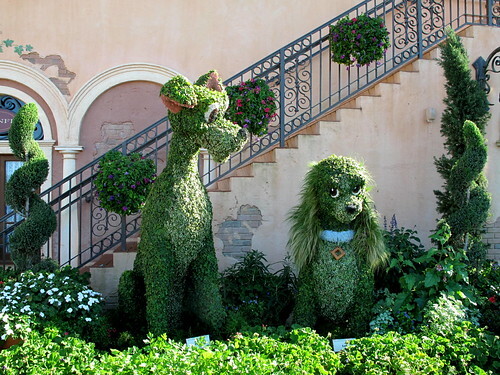 I especially love the Lady and the Tramp topiary. I think it’s the nostalgia. Great shots as always Ms. Pearl! Thank you! 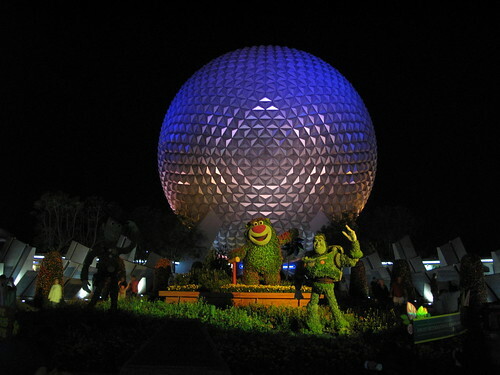 I had never been to Epcot, because I lived in California for years. Was very surprised at how lovely Epcot was. 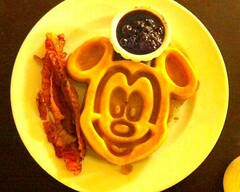 Is that a Mickey Mouse waffle?! I don’t like waffles (especially $20 waffles) but still. Thanks for sharing Disney this morning. My eyes and camera would have been drawn to the door handle and topiaries as well. Beautiful! I have more pics of topiaries, but they were shot in the midday sun and are pretty washed out. I really like the first one and the one with the Norwegian church. I’d like to see the real thing too. Such an interesting architecture. I haven’t been in Scandinavia yet but I’d like to visit. I’ve seen another replica in the Midwest and they are beautiful. No nails anywhere. I love these shots Ms. Pearl! Makes me want to go visit myself! 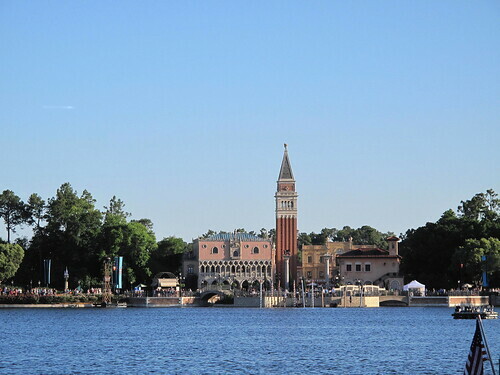 I haven’t been to Epcot since I graduated from University (as a mature adult in 1985 or ’86). Got close but no cigar last year at a client conference – Disney Hilton. Such a magical place … did it make you feel like a kid again? I felt like a grownup at Epcot, Cheryl, but the Magic Kingdom was a different story! Once we got on the Peter Pan ride, I was ten again. 🙂 That’s how old I was the first time I went to Disneyland and I will never forget it. Peter Pan is still my favorite ride. I don’t know why I love that ride so much because it’s pretty simple and low budget compared to the others at Disneyland, but it’s always the one I ride twice. I love it too. The lines were so long for that ride, we had to get a FastPass four hours ahead of time. There were a lot of adults on it too. 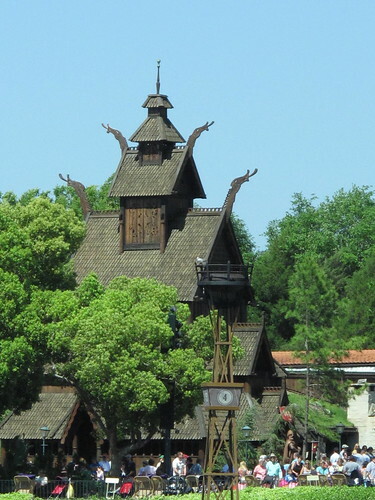 Norway pavilion – wow, that is gorgeous.